Is your refrigerator not working right? Have you ever gone grocery shopping and stocked your fridge with food only to find that the very next day your refrigerator is not working? When this happens it is maddening and you want someone to fix it on the double. A broken fridge means spoiled food and that is the worst. We are experienced with refrigerator repair, providing excellent knowledge and proficient service that you can count on every time. A simple repair of a refrigerator can keep you from spending too much money to replace it. New refrigerators are a large expense that can be avoided by calling us today. At Just Appliance Repairs, we will handle your problems quickly and we get it right. We work on any and all major brands, from Whirlpool and Maytag to Samsung and LG. Whether it’s a traditional refrigerator or a side by side we have your covered. Most of the time we have the parts with us to get your refrigerator fixed the first time we come to evaluate your machine. 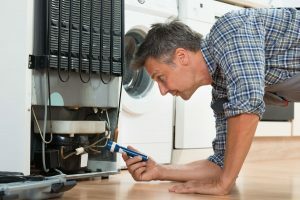 We are skilled with expert knowledge of modern refrigerators with their onboard computer systems and multiple sensors that need to work in harmony. Call us now at (321) 420-0025.